On June 14, 2011 the U.S. Food and Drug Administration (FDA) announced new requirements for sunscreens currently sold over-the-counter (OTC) (i.e. non-prescription). These requirements support the Agency’s ongoing efforts to ensure that sunscreens meet modern-day standards for safety and effectiveness. Prior rules on sunscreens dealt almost exclusively with protection against sunburn, which is primarily caused by ultraviolet B (UVB) radiation from the sun, and did not address ultraviolet A (UVA) radiation, which contributes to skin cancer and early skin aging. After reviewing the latest science, FDA determined that sufficient data are available to establish a “broad spectrum” test for determining a sunscreen product’s UVA protection. Passing the broad spectrum test shows that the product provides UVA protection that is proportional to its UVB protection. Sunscreen products that pass the broad spectrum test are allowed to be labeled as “Broad Spectrum.” These “Broad Spectrum” sunscreens protect against both UVA and UVB rays. Scientific data demonstrated that products that are “Broad Spectrum SPF 15 [or higher]” have been shown to reduce the risk of skin cancer and early skin aging when used with other sun protection measures, in addition to helping prevent sunburn. Other sun protection measures include limiting time in the sun and wearing protective clothing. Everyone is potentially susceptible to sunburn and the other detrimental effects of exposure to UV radiation. Products that pass the broad spectrum test will provide protection against both ultraviolet B radiation (UVB) and ultraviolet A radiation (UVA). Sunburn is primarily caused by UVB. Both UVB and UVA can cause sunburn, skin cancer, and premature skin aging. A certain percentage of a broad spectrum product’s total protection is against UVA. Under the new regulations, sunscreen products that protect against all types of sun-induced skin damage will be labeled “Broad Spectrum” and “SPF 15” (or higher) on the front. 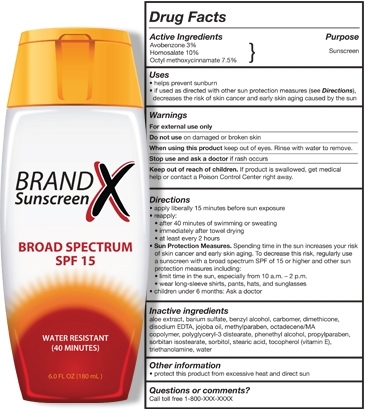 The new labeling will also tell consumers on the back of the product that sunscreens labeled as both “Broad Spectrum” and “SPF 15” (or higher) not only protect against sunburn, but, if used as directed with other sun protection measures, can reduce the risk of skin cancer and early skin aging. For these broad spectrum products, higher SPF (Sun Protection Factor) values also indicate higher levels of overall protection. By contrast, any sunscreen not labeled as “Broad Spectrum” or that has an SPF value between 2 and 14, has only been shown to help prevent sunburn. In addition to the final regulations, in June 2011 FDA proposed a regulation that would require sunscreen products that have SPF values higher than 50 to be labeled as “SPF 50+.” FDA does not have adequate data demonstrating that products with SPF values higher than 50 provide additional protection compared to products with SPF values of 50. FDA also requested data and information on different dosage forms of sunscreen products. The agency currently considers sunscreens in the form of oils, creams, lotions, gels, butters, pastes, ointments, sticks, and sprays to be eligible for potential inclusion in the OTC sunscreen monograph – meaning that they can be marketed without individual product approvals. The agency currently considers wipes, towelettes, powders, body washes, and shampoo not eligible for the monograph. Therefore, they cannot be marketed without an approved application. For sunscreen spray products, the agency requested additional data to establish effectiveness and to determine whether they present a safety concern if inhaled unintentionally. These requests arose because sprays are applied differently from other sunscreen dosage forms, such as lotions and sticks. In addition, FDA issued a draft guidance to help sunscreen manufacturers understand how to label and test their products in light of the final and proposed regulations and the data request on dosage forms. Use sunscreens with broad spectrum SPF values of 15 or higher regularly and as directed. Limit time in the sun, especially between the hours of 10 a.m. and 2 p.m., when the sun’s rays are most intense. Wear clothing to cover skin exposed to the sun; for example, long-sleeved shirts, pants, sunglasses, and broad-brimmed hats. Reapply sunscreen at least every 2 hours, more often if you’re sweating or jumping in and out of the water. Hydrate! Drink lots of water and good fluids! (Soda products will just make you more thirsty, so try homemade lemonade or iced tea, or just plain water. Wear protective eye ware! Even children should wear real sunglasses with UV protection, not just those play sunglasses. Located here, are a couple of helpful videos. It’s important to limit sun exposure between 10 a.m. and 2 p.m., when the sun’s rays are strongest. Even on an overcast day, up to 80 percent of the sun’s UV rays can get through the clouds. Stay in the shade as much as possible throughout the day. Wear clothes that protect your body. If you plan on being outside on a sunny day, cover as much of your body as possible. Wear a wide-brimmed hat, long sleeves, and pants. Sun-protective clothing is now available. 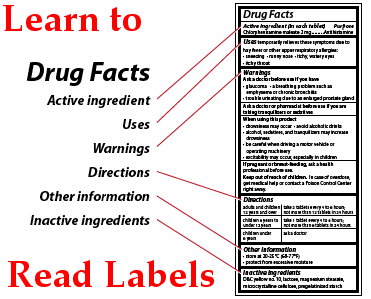 However, FDA only regulates such products if the manufacturer intends to make a medical claim. Consider using an umbrella for shade. a “sun protection factor” (SPF) of 15 or more. SPF represents the degree to which a sunscreen can protect the skin from sunburn. water resistance—sunscreen that stays on your skin longer, even if it gets wet. Reapply water-resistant sunscreens as instructed on the label. Look For: SPF of 15 to 50, depending on your skin tone and the sun’s intensity – being near or in the water, or taking a walk through a wooded park. Look For: Lotions, not sprays or powdered formulas – you have more control over coverage. 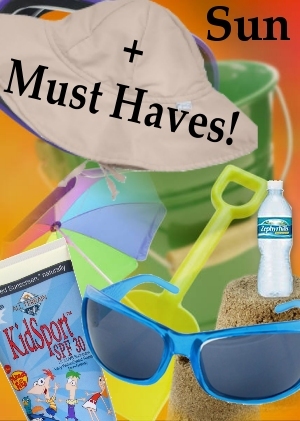 Look For: A Water Resistant formula for the beach or swimming pool, or for boating. Avoid: Salicylates – Salicylates were first used in cosmetics as Benzyl salicylates. Currently octyl salicylate is the major salicylate component of sunscreen. Salicylates protect against a small part of the UVB spectrum and must be used in high concentrations. They are aspirin-like substances. With the increased use of sunscreens it is not surprising that there has been an increase in reports of adverse reactions to sunscreens. Avoid: Vitamin A (retinyl palmitate) which causes skin cancer in laboratory tests. Apply the recommended amount evenly to all uncovered skin, especially your lips, nose, ears, neck, hands, and feet. Apply sunscreen 15 minutes before going out in the sun. If you don’t have much hair, apply sunscreen to the top of your head, or wear a hat. Give babies and children extra care in the sun. Ask a health care professional before applying sunscreen to children under 6 months old. Apply sunscreen to children older than 6 months every time they go out. Sunlight reflecting off snow, sand, or water further increases exposure to UV radiation and increases your risk of developing eye problems. When buying sunglasses, look for a label that specifically offers 99 to 100 percent UV protection. Eye wear should be labeled “sunglasses.” Otherwise, you can’t be sure they will offer enough protection. Pricier sunglasses don’t ensure greater UV protection. Ask an eye care professional to test your sunglasses if you don’t know their level of UV protection. People who wear contact lenses that offer UV protection should still wear sunglasses. Wraparound sunglasses offer the most protection. 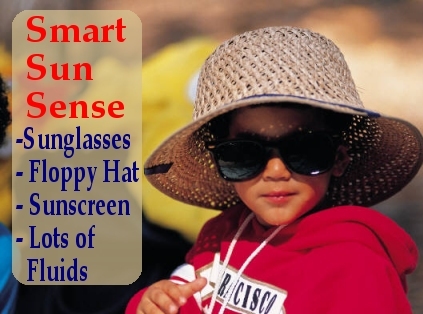 Children should wear real sunglasses (not toy sunglasses!) that indicate the UV protection level. 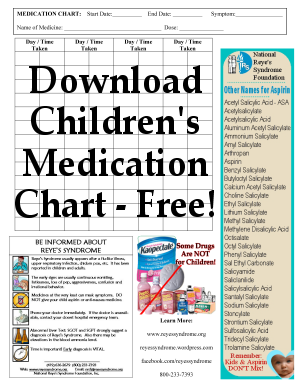 Never give a child up to the age of 19 aspirin or aspirin containing products because you could trigger a deadly disease known as Reye’s Syndrome. Sunscreens are recommended for children and adults. What makes babies so different? If there’s no way to keep an infant out of the sun, you can apply a small amount of sunscreen—with a sun protection factor (SPF) of at least 15—to small areas such as the cheeks and back of the hands. Sachs suggests testing your baby’s sensitivity to sunscreen by first trying a small amount on the inner wrist. 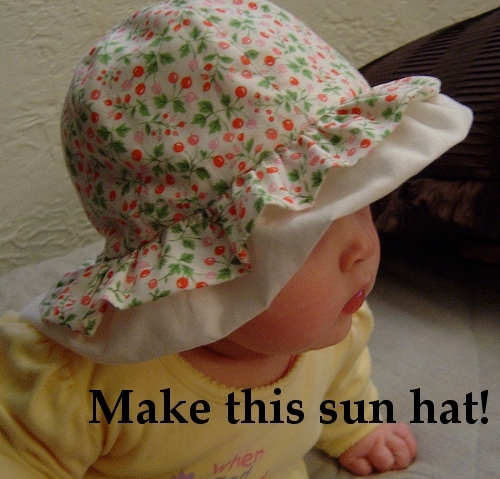 Make this oh-so-cute Sun Hat for Baby! 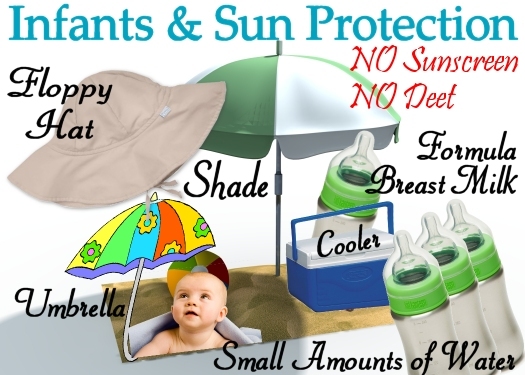 Keep your baby in the shade as much as possible. If you do use a small amount of sunscreen on your baby, don’t assume the child is well protected. Hydrate! Give your baby formula, breast milk, or a small amount of water between feedings if you’re out in the sun for more than a few minutes. Don’t forget to use a cooler to store the liquids. Avoid sunscreens containing the insect repellent DEET on infants, particularly on their hands. Young children may lick their hands or put them in their mouths. According to AAP, DEET should not be used on infants less than 2 months old. Make sure you talk with your pediatrician, or pharmacist if your baby is taking medications of any kind. 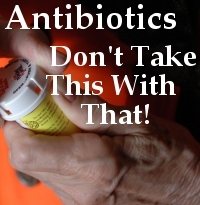 Sun and some Medications can cause bad interactions. 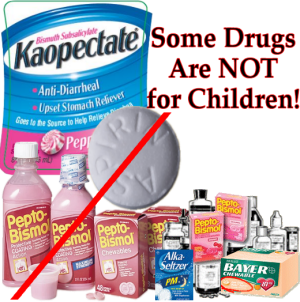 Never give an Infant or Child under the age of 19 aspirin, or use aspirin (salicylate) containing products as it could trigger Reye’s Syndrome, a deadly disease.